District Consumer Disputes Redressal Forum, Assam. 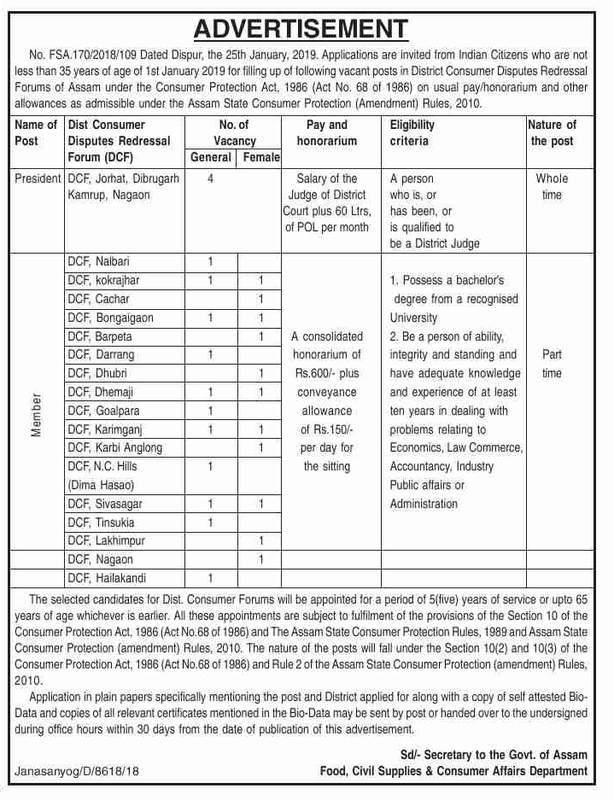 Applications are invited from Indian Citizens who are not less than 35 years of age of 1st January 2019 for filling up of following vacant posts in District Consumer Disputes Redressal Forums of Assam under the Consumer Protection Act, 1986 (Act No. 68 of 1986) on usual pay/honorarium and other allowances as admissible under the Assam State Consumer Protection (Amendment) Rules, 2010. DCF District Name/s: Jorhat, Dibrugarh, Kamrup, Nagaon. Eligibility Criteria: A person who is, or has been, or, is qualified to be a District Judge. Pay and Honorarium: Salary of the Judge of District Court plus 60 Ltrs, of POL per month. DCF District Name/s: Nalbari, Kokrajhar, Cachar, Bongaigaon, Barpeta, Darrang, Dhubri, Dhemaji, Goalpara, Karimganj, Karbi anglong, N.C Hills (Diam Hasao), Sivasagar, Tinsukia, Lakhimpur, Nagaon, Hailakandi. b) Be a person of ability, integrity, and standing and have adequate knowledge and experience of at least ten years in dealing with problems relating to Economics, Law Commerce, Accountancy, Industry Public Affairs or Administration. Pay and Honorarium: A consolidated honorarium of Rs.600/- plus conveyance allowance of Rs.150/- per day for the sitting. The selected candidates for Dist. Consumer Forums will be appointed for a period of 5(five) years of service or upto 65 years of age whichever is earlier. How to apply: Application in plain papers specifically mentioning the post and District applied for along with a copy of self attested Bio-Data and copies of all relevant certificates mentioned in the Bio-Data may be sent by post or handed over to the undersigned during office hours within 30 days from the date of publication [26/01/2019] of this advertisement.